Craters on Dione - Solar System Planets And Moons Section. Large Craters on Dione. /JPL/SSI. This Cassini photograph shows several of the large craters that pockmark Dione, one of Saturn's moons. The most prominent crater in the image is 188 km (73 mile) Dido, and the smaller crater above it is Antenor. On the sunlit side you can see some of the wispy markings, which Cassini has revealed to be a complex system of fractures in the moon's surface. Large craters across the surface of Dione. Image credit: NASA/JPL/SSI. When naming features on other worlds, scientists like to follow themes, and Dione is no exception. 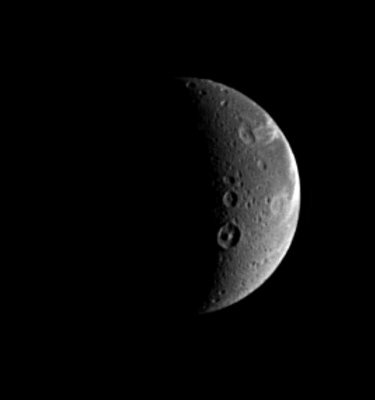 Dione possesses numerous features with names from Virgil's "Aeneid." The prominent crater showing a central peak below the center is Dido, a 118-kilometer-wide (73-mile) crater named after the supposed founder of Carthage. The crater just above Dido is Antenor, an 82-kilometer-wide (51-mile) impact crater named after the nephew of Priam who founded the Italian city of Padua. At the upper right is the 97-kilometer-wide (60-mile) impact crater Turnus, which lies at the western end of Carthage Linea, a region of bright, fractured terrain. Dione is 1,118 kilometers (695 miles) across. The sunlit terrain seen here shows some of the wispy markings on the moon's trailing hemisphere. Cassini revealed that these markings are actually a complex system of fractures. North on Dione is up and rotated 25 degrees to the left. The image was taken in visible light with the Cassini spacecraft narrow-angle camera on Aug. 25, 2005, at a distance of approximately 1.1 million kilometers (700,000 miles) from Dione and at a Sun-Dione-spacecraft, or phase, angle of 107 degrees. Resolution in the original image was 7 kilometers (4 miles) per pixel. The image has been magnified by a factor of two and contrast-enhanced to aid visibility.